Tram routes 2, 3, 4 and 7 will be diverted on night of Monday 1 October and tram routes 2 and 3 on the night of Tuesday 2 October from midnight to the end of service due to track works carried out by the Senate Squeare. 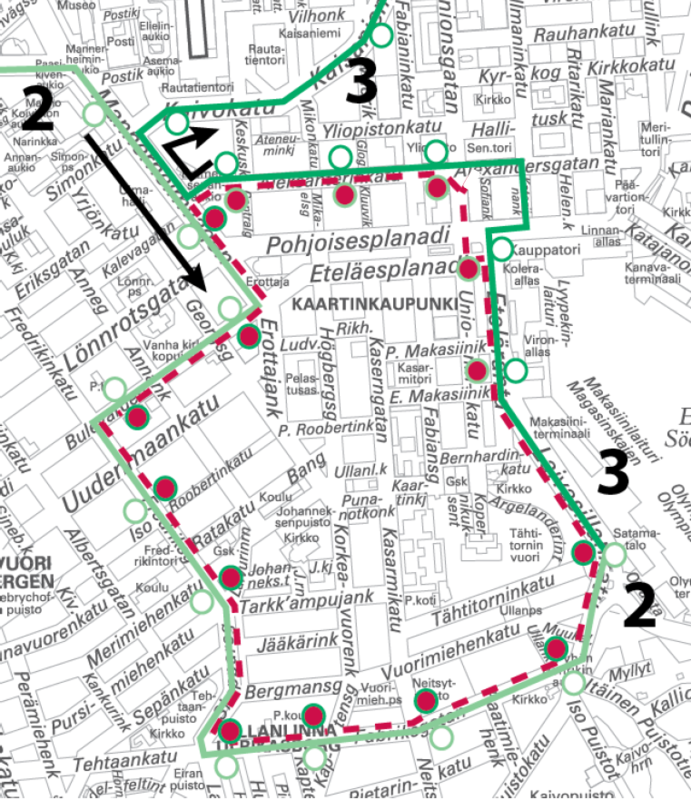 Tram 2 will run from Lasipalatsi to Olympia Terminal using the route of tram 3: Mannerheimintie-Bulevardi-Fredrikinkatu-Laivurinkatu-Tehtaankatu-Laivasillankatu. 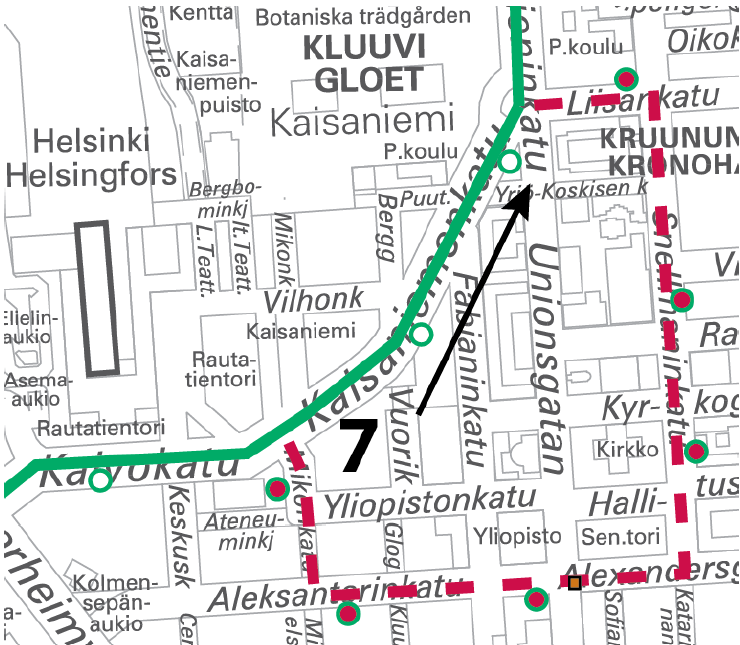 The following stops will not be served: "Ylioppilastalo" (on Aleksanterinkatu), "Aleksanterinkatu", "Senaatintori", "Kauppatori" and "Eteläranta". 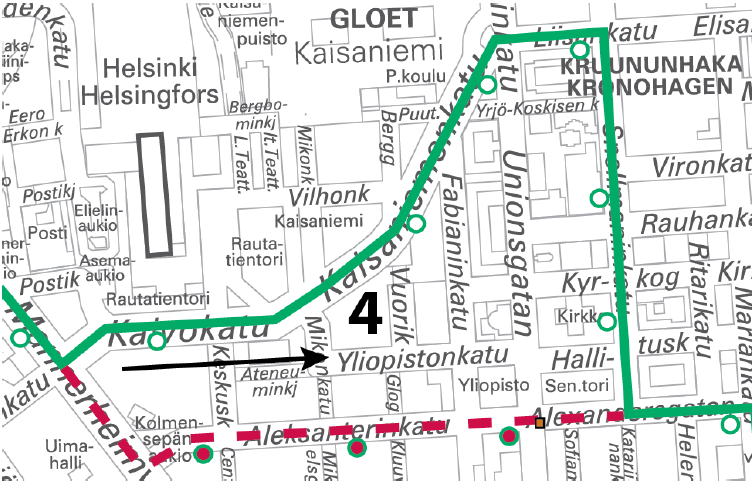 Tram 4 will run to Katajanokka via Liisankatu. Aleksanterinkatu will not be served. Tram 7 will run to Pasila direc along Kaisaniemenkatu. Mikonkatu, Aleksanterinkatu and Snellmanninkatu will not be served. Tram 2 will from Lasipalatsi to Olympia Terminal using the route of tram: Mannerheimintie-Bulevardi-Fredrikinkatu-Laivurinkatu-Tehtaankatu-Laivasillankatu. The following stops will not be served: "Ylioppilastalo" (on Aleksanterinkatu), "Aleksanterinkatu", "Senaatintori", "Kauppatori", "Eteläranta"